Please refer to our stock # 3009 when inquiring. 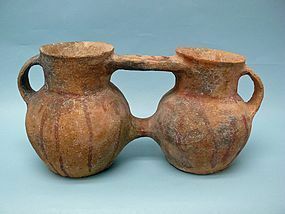 Rare Early Bronze Age I Bridge Twin Jug, Canaanite ca. 3100 - 2900 BCE. With side handles and pigment remaining on twin bodies of vessel. Puncture design incisions around each neck. Intact with encrustation due to age. Rare and in excellent condition.7 1/2" high x 14 1/2" long x 6 1/4" deep. Ex: Archaeological Center, Old Jaffe. The Early Bronze Age I is marked by rural proto-urban (unwalled) cities. The EB I is continuous with the Chalcolithic, especially in the north. Houses are mostly either: apsidal, with a curve at one end; ellipsoidal, with both ends curving; or, occasionally, caves. Burial customs included: caves, most commonly; shaft tombs; charnel houses, where bodies were laid out like in a tomb; nawamis, field stone chambers which still stand in the Sinai today; and cremation. The Canaanean Blade first appeared in the EB I, a blade with a trapezoidal cross-section. Later in the Early Bronze Age I, Egypt begins interacting with the Negev, South Coast and Sinai. There were regional ceramic families. A notable site is Bab edh-Dhra, inhabited from 3100 - 2000 BCE.